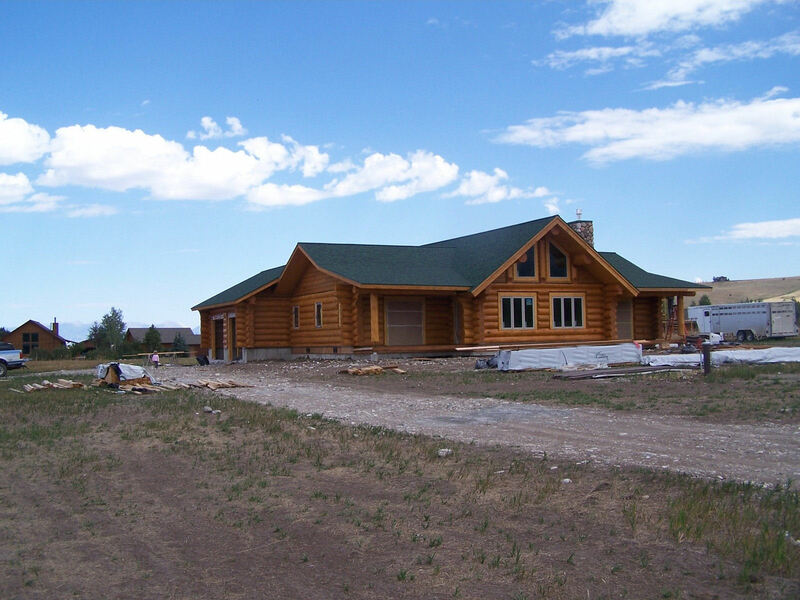 We invite you to watch the progression of a handcrafted log home that we are building to turnkey completion here in the Bozeman, Montana area. We broke ground yesterday, April 9th, 2012 and project a completion by November or December 2012. 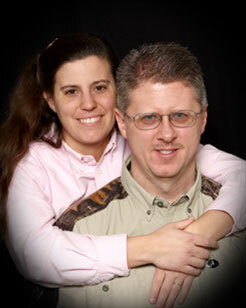 Through photos and videos we will show the chronology from start to finish. We are building a custom log home plan, The Bear Creek. 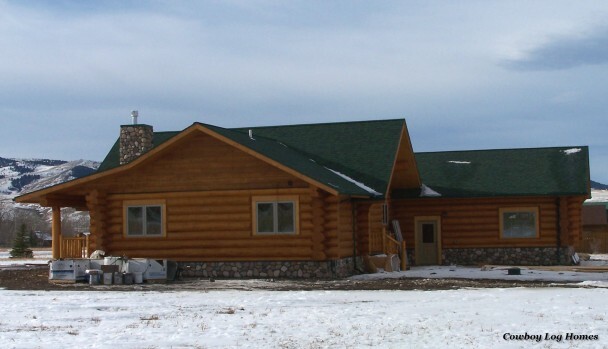 It is 1760 square feet with an attached 24×26 solid log garage. This plan offers three bedrooms, two baths, open great room, and several other features customized by the owners. 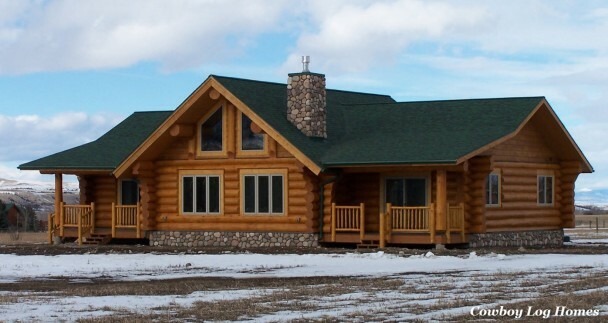 The front elevation of the Bear Creek has many attractive features. The first is roof line. The center section is a 9/12 pitch roof. The wings to each side are a 6/12 pitch. The great room is located in the center of the home. The wing to the left is for the master suite and the wing to the right is for the 2nd and 3rd bedrooms. If you look closely at gable in the middle of this side you will see three round log ends and three vertical logs. The top round log end is the ridge beam. The one on each side are purloins. The three vertical logs support the ridge and purloins within the gable end and allow for the large trapezoid windows. Inside the great room there are also two handcrafted king trusses. There are two covered porches, one on each side with the sliding glass door located in the center. The support posts for the covered porch roof can be seen on either end of the first photo. A stone chimney cuts through the roof on the front right corner of the cabin. The chimney will be covered in cultured river rock stone above the roof line. It is for the venting of a corner propane fireplace insert. Inside matching river rock work will cover the wall surrounding it. And finally, to the extreme left of the above photo you will see another section of the home. This is the edge of the garage. The large trapezoid windows will allow wide views of the Bridger Mountains into the great room. The back elevation show the end of the garage and the rear of the house. The door on this side opens into the dining area. This elevation gives a better estimation of the two car garage. It will also be built of handcrafted solid log. 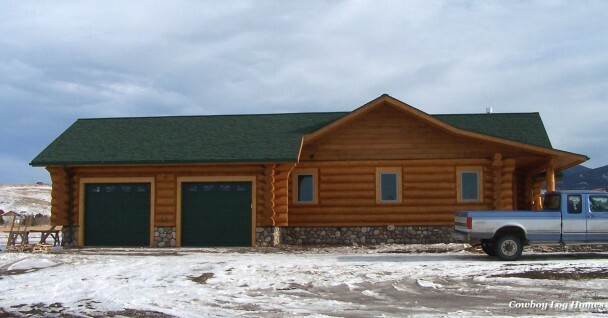 It is not a good idea to attach a framed garage to a solid log home (without the use of a breezeway). The window to the right of the door opens into the kitchen. The right side of the homes shows the bedroom 2 and 3 wing and garage. Beginning from the left side, the porch roof lines can now be seen. They are a shed style roof off of the main house and have a lower roof line. The support post is a round handcrafted log. Also you can see the roof is supported with another round log laid horizontally on top of log support post. The chimney is on the front side of the roof line. The windows on this side open into bedrooms 2 and three. The door to the right opens into the garage. And the window on the extreme right opens into the garage. This is our final elevation. It shows the master suite side of the home and reveals where the garage doors open. The log ends of the garage show that it is in fact solid stacked logs. The ridge of both the garage and the master suite wind match. The first window from the left opens into the master bath. Windows 2 and 3 open into the master bedroom, and the door on this side opens into the living area space of the great room. This is the front door. The matching covered porch roof line can also be seen on this side. The home is being built on a crawl space foundation for the home and a cement slab for the basement. Now for the floor plan of the Bear Creek. Please click the floor plan to enlarge it. The walls are shown with the thick logs and the log corners. There is a solid log interior wall on each side of the great room. 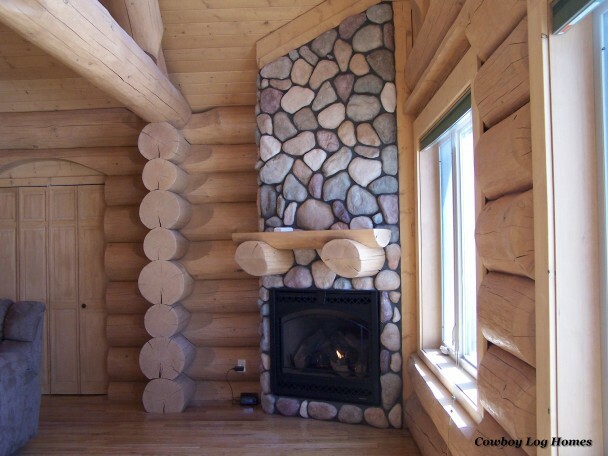 Log tails can be seen intersecting with the exterior log wall. There is also a solid log wall between the garage and the master bath and laundry. Structurally this is the best way to build this log home. The log roof system over the great room includes the ridge and purloins that traverse the home front to back. One of the king trusses is located over the great room area. 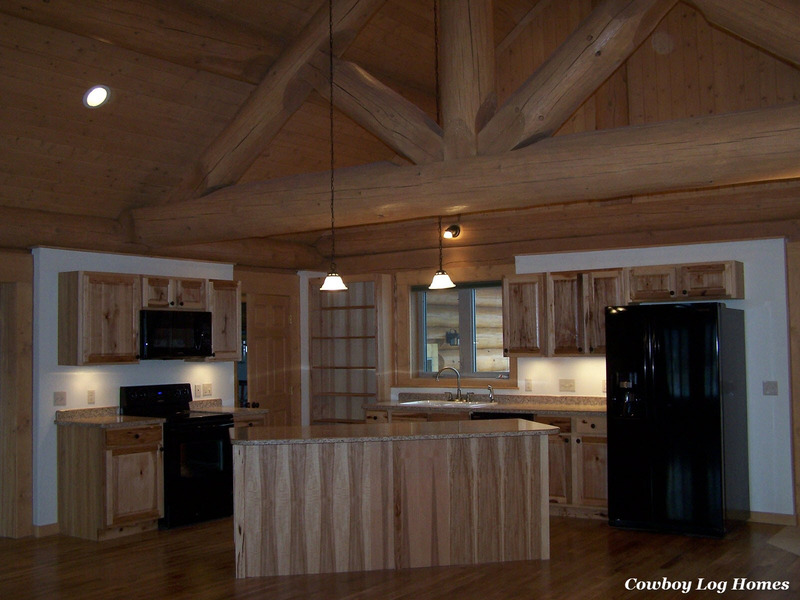 The second truss is located over the dining and kitchen area. For the rest of the home standard flat bottom trusses are being used. Over the bedroom wings decorative log purloins are being added to give more of a log feel to the flat ceiling. Also 1×6 pine tongue and groove is being installed for the bedroom wing ceilings and the great room ceiling. The porches are 8 feet wide. The porch ceilings will also be covered in 1×6 pine tongue and groove. The end of the great room steps out 8 feet. This feature was added because the owners wanted the entry door on the side. 8 feet of solid log was required to make this work. There is a certain amount of wall space that is needed to make a door and two log corners tie together. The corner stone fireplace and be seen located in the end of the great room. For the outside of the home we are only stoning the chimney above the roof line. This way more of the exterior log wall wall is left visible. A first floor laundry and furnace room was added as a transition between the house and the garage. We look forward to sharing each step of this custom handcrafted log home with you!